Everyone Makes Mistakes, How Do You Recover? I play a bit of chess every now and then. Ok fine I love it and play every day lol. One of the things I’ve learnt in playing and studying the game is that EVERYONE, no matter how much of a grandmaster they are, make mistakes from time to time. Sometimes the “mistake” isn’t actually a mistake – your opponent may have just had a clearer vision of the future moves than you and forced you into a trap. What separates the good players from the weak ones, and the truly great from everyone else, is how they recover from the mistake. I’ve seen chess players recover from almost hopeless situations because they didn’t panic. Instead, they calmly assessed what resources they had left, what their position was, what their opponent’s position was, and how they could use all that to their advantage. How can you apply this to your everyday life? Has life knocked you down? Get back up. Until you lose your figurative King (ie your life), you’re still in the chess game of life. You still have a magnificent array of tools at your disposal. How can you use your natural talents to improve your situation? What Pawns can you promote into Queens? As in, what talents do you have that if you worked on you could turn into incredible strengths? If you’re doing well out of life, how can you press home your advantage? What plans or strategies can you put in place to make your continued success virtually guaranteed? 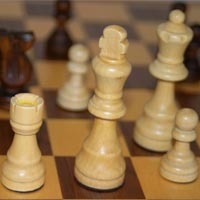 How can you take lessons from chess and apply them to your life? Fabulous post. The times when we grow the most are usually the difficult times – times that may seem like mistakes, but end up being the reason we take a different turn which ends up at a much better destination! Good post, I’ve been playing chess since I was nine, I never get bored of it.